Best friends Ava and Gen start their freshmen years of college on opposite sides of the country. They keep in touch through a series of text messages and emails. Their friendship develops and hits rocky roads when dealing with self-discovery, heartbreak, mental health and weird roommates. As each young woman grows, readers wonder if their BFF-ship will survive. Will they still be best friends living side-by-side in a gated community like the Golden Girls? 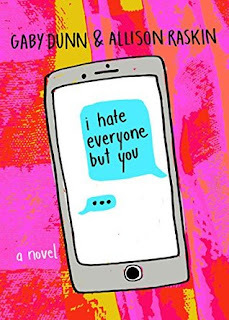 I Hate Everyone But You had potential to be a good YA novel but it fell short. I absolutely love books in e-mail or text message format. But this one I grew tired of real quick. Not because of the writing style or content but because of the annoying characters. I kept asking if I acted like this during my first year of college with friends back home or enrolled at different schools. Hopefully not! Maybe this book is relatable to younger women but it's a hard pass for 30-somethings. Happy Pub Day, Gaby & Allison! I Hate Everyone But You is now available.